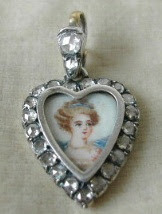 Jewellery was not as popular during the Regency Era as one might surmise and its blatant use was considered vulgar. Nevertheless, beautiful examples survive from that era in the form of delicate earrings, necklaces, and bracelets, as in the heart pendant from 1800 above, the garnet and crystal ring and the long diamond and emerald earrings below. Diamonds were the preferred gemstone during this period, but pearls were also popular. As always, the Prince Regent lived according to his own extravagant standards. In An Elegant Madness: High Society in Regency England, Venetia Murray writes: The Prince was clearly unable to pass a jewellery shop without buying what he referred to as a 'trinket', meaning anything from a diamond tiara to a butterfly brooch with emerald eyes. Among the fashionable jewellers he patronized were Hamlet's - whose customers included the Duke of York, the Duchess of Cloucester and various foreign rolyals - Thomas Gray in Sackville Street and Phillips in Bond Street. But his favoroute by far was Rundell and Bridge on Ludgate Hill, the principal goldsmiths and jewellers at the time. "Sense and Sensibility" was, as yet, unwritten in 1796, and we can imagine the future author taking note of the various localities in the neighbourhood which she afterwards introduced into her story. Sackville Street is close by, in which she placed the shop of Mr. Gray, the jeweller at whose counter Elinor and Marianne were kept waiting whilst the coxcomb Robert Ferrars was giving elaborate directions for the design of a toothpick case. At last the affair was decided. The ivory, the gold, and the pearls, all received their appointment, and the gentleman having named the last day on which his existence could be continued without the possession of the toothpick case, drew on his gloves with leisurely care, and bestowing a glance on the Miss Dashwoods which seemed rather to demand, than express, admiration, walked off with a happy air of real conceit and affected indifference. 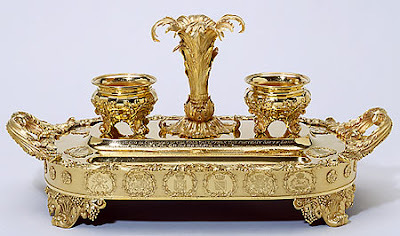 The Castlereach Inkstand, Rundell and Bridge, 1817-1819. Click here for details. Blimey! I love that pearl earring, so lovely! But I think it must be rather heavy, eh?